The perfect introduction to San Francisco's essential sights. 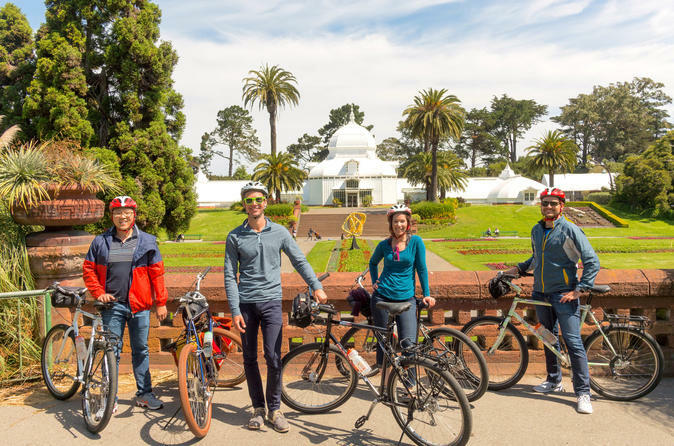 Discover SF's must-see neighborhoods, most vibrant public art, grand victorian architecture, Golden Gate Park, fascinating history, and much more, from a cool local perspective on this exciting 4-hour bike tour. This San Francisco bike tour is the perfect introduction to the city and explores all of our favorite local sights, those essential, authentic, and must-see places beloved by locals and visitors alike. Discover the city’s world-renowned natural beauty and legendary neighborhoods on this spirited (and nearly all flat!) ride highlighting Golden Gate Park, Haight-Ashbury, the Castro, the Mission District, and so much more. Along the way we’ll discover stunning views of the city skyline from the DeYoung Museum and tour the lush landscapes of Golden Gate Park. We’ll also learn the fascinating history of the city’s favorite parks, distinctive neighborhoods, Victorian architecture, and it’s forgotten World Fair. Mission District – We’ll start and finish here– it’s our home & SF’s most vibrant ‘hood. A ‘city-within-a-city’, it’s SF’s oldest, hippest, and most diverse place. Home to incredible mural art, SF’s best burritos, and lots of cool history.